The SF45 Training Packet I contains the first four plans in MTI’s SF45 programming library: Alpha, Bravo, Charlie and Delta. Heavy, Low Volume Strength – think heavy barbel and 1-4 reps per set. The goal is to increase or maintain relative strength (strength per bodyweight) in the most efficient manner possible. Some SF45 cycles will feature bodyweight strength training, but none will include moderately loaded free weight strength training in the 5-12 reps per set range. This is to avoid unnecessary joint impact. Alpha, Bravo and Charlie deploy this type of strength training. SF45 Delta steps away from the barbell and deploys bodyweight strength training. Deep Loaded Squat Avoidance – For our over-40 lab rats, it’s nearly impossible to do heavy back or front squats without limited joint pain. Lower body strength training in these cycles will focus on lunges, hinge lifts and bodyweight or lightly loaded complexes. 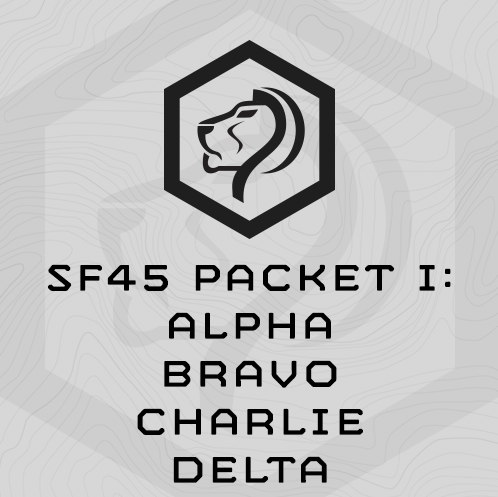 Four SF45 plans are included in this packet: Alpha, Bravo, Charlie, Delta. 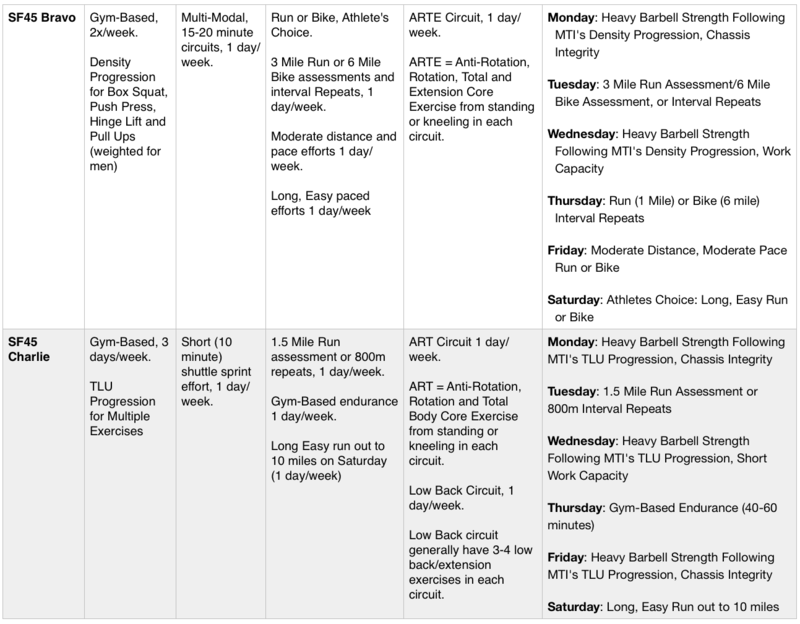 Each SF45 plan is a 6x/week, 7 week training plan. Week 7 of each plan is an unload week, so the plans may be run back-to-back. Click the links below and see the following chart for more specifics on each plan. Click on the individual plan links below, then click the “Sample Training” page tab to see the entire first week of programming. The $79 Price for the packet represents a 30% savings over purchasing the plans individually and saves you $39!